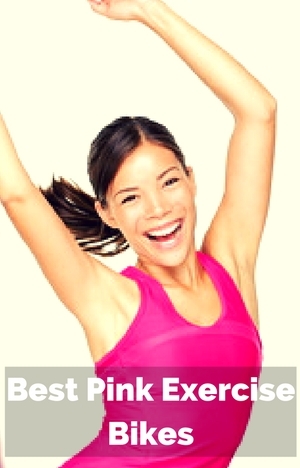 The best pink exercise bikes come in a range of different styles so there should be one that fits your requirements. Which is why I thought I’d put this together to save you searching around the internet. However, most of them aren’t for people looking for very tough training regimes (except for the last bike in this best of list). You may notice that my selection of the best pink exercise bikes all come from the same supplier. The reason is that they are the only ones that have good ratings from a good number of customers. The other bikes don’t have this and only have 1 or 2 reviews that doesn’t really help too much. They all have the same good looks with their striking pink coloring. This is a good bike for those who are beginning their exercise or wanting moderate levels of exercise. It has 8 levels of magnetic resistance and a belt drive that provides a very quiet and smooth operation. You can easily watch the TV or workout without disturbing others at any time of the day or night. There is a basic console to help to keep you informed of progress of your workout. The seat adjusts up and down to help you get the position for an effective workout and for the most comfort too. It can be used by more than one person too. It is reasonably compact needing only 31.5 by 21.7 inches when not in use. It holds you steady while you workout and all seems to be durable too. This is a great bike if you need to think about space or want to be able store the bike out of the way when not in use. It will fit in a cupboard or behind a door. It only takes seconds to fold it up. It can be adjusted to fit a range of heights with maximum weight of 220 lbs. The seat adjustment is quick to do so it can be used by more than one. You sit on this bike in a semi-recumbent bike position with your legs out in front and down on an angle. It is a different riding position but most find it comfortable and easy on their knees. The seat has a back rest so you do get some support for the back too. There are arm rests by the seat and at the front so you can use in different riding positions. It has adjustable magnetic resistance and belt drive. it is quiet and smooth. It is suitable for beginners and those looking for moderate exercise. When not in use it needs about 20 by 20 inches area for storage. Customers have found it provides a quiet and steady workout. And they like the folding feature too. Read more about the bike in my review here. This is more for those who want good support for their back and a more comfortable seating position. It has a large seat with good back rest. Your feet are out in front of you to help with this. It is comfortable and low impact on the joints. The bike operates smoothly and very quietly with 8 levels of magnetic resistance and belt drive. It won’t disturb others as you workout. The seat can be adjusted to accommodate different heights – which can be done quickly so more than one person can use. It does take up a little more room requiring an area of 26.6 by 53 ins when not being used. It does have wheels at the front that you tip the bike on to when you want to move it. It is again more for people just beginning up to those looking for moderate exercise. It is a good bike for beginners and those looking for moderately hard spinning type workouts, although if looking for something tougher they would be better considering the bike below . It has a 22 lbs flywheel which does help smooth the pedaling motion but you may find it pulses a lot at the tougher resistance levels. It has a chain drive and friction resistance pad which helps to give the feel of a road bike. You will find that it makes the same amount of noise too. The seat is like any bike seat so you may not find it the most comfortable thing you’ve ever sat on to say the least. It has a maximum user weight of 240 lbs. This bike has some more advanced features than the previous indoor cycle abouve. It can be used by beginners but will serve more advanced users better too. It has 40 lbs flywheel which helps provide more inertia to pull pedals though pedal cycle especially at tougher resistance levels and when out of the saddle pushing away for the hill climbs and sprints. But you can also take it easy if you want and it is a bike that as you get more fit it can cope with that too. It is designed to accommodate users up at maximum weight of 265 lbs. The dual pedals attach to a three piece crank that provide strength and durability for those tougher workouts. The dual pedals take SPD shoes or athletic shoes which makes it great if you have specialist shoes already or want them in the future or if more than one person is using the bike and some have and some don’t have the shoes. It has a belt drive which makes the bike quieter than those with a chain. The only noise is the resistance pad rubbing on the flywheel. There aren’t any customer reviews at present and I’ve yet to provide a full review of this new model. Based on the response by customers on other models I feel this is likely to be well received. In choosing the bikes I’ve gone through the pinks bike available. I’ve looked closely at their specifications and customer reviews. I’ve read through their product listings, descriptions, manuals and asked questions of the supplier as needed to get a good idea of how the bikes operate. I’ve then ranked them to come up with a list of bikes in each of the different categories of bikes where a pink version is available. As I said above some of the bikes were similar and I went then with the models that had more positive ratings from customers as there wasn’t a difference in the features to choose between them that way. With pink exercise bikes you don’t have to pay extra for the color and they do provide a good basis for low impact workouts that are similar to other bikes in the price range. The bikes can also cover different needs and wants too – from recumbent to spinning workouts. You can get a good solid workout (up to moderately hard level in most cases) and have it in a striking pink color rather than the dull grey that seems to be favored for exercise bikes.